So, for a while now we have alluded to us working together with several festivals. The time has come to tell you a little bit more about one of these projects! For the past few months we at CeltCast have been in close contact with the amazing people of Archeon . Having visited their Midwinter Fair Archeon many years on end, it’s quite something to now having a proud part in organising the festival! We did some brainstorming with them on general matters, but of course mainly helped to set up part of the musical program of this year’s Midwinter Fair Yule Fest ! We were (are) the linking pin between the organisation, the bands, and the dance instructors. Working closely together our two organisations have come up with a musical line-up that will knock your socks off! Not all bands have been announced yet, but they will be soon. In the meantime, we are certainly looking forward to some stomping energy provided by Sassenachs and some medieval partying with Pøbel ! We can’t wait to dream away to the beautiful sounds of EMIAN PaganFolk and to be woken up again by the musical power of Trolska Polska ! Meanwhile there will be a part of the festival dedicated all weekend to the dance! Balfolk workshops, Irish dancing lessons and a few brilliant bands to accompany them, among others the very first Dutch performance by EMIAN duo ! Have we peeked your interest yet? No? Well, how about if we tell you about the storytellers? The wandering musicians? The craftsmen and the marketplace? New this year is a Yule ritual in which everyone is free to partake or just watch. We have seen some of the plans for the ritual, and trust us, it will be special! 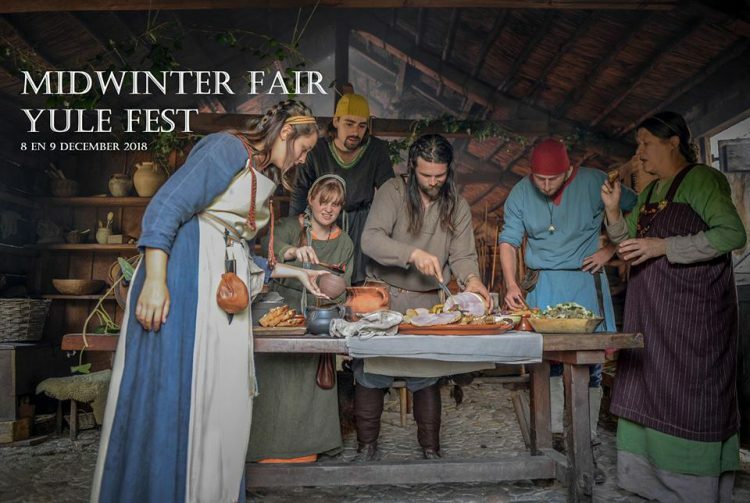 And of course the key feature of the location, the historically accurate reproduced buildings, from eras ranging from early prehistory to the late middle ages, that give the event its special atmosphere, enhanced by the many fires all over the grounds. We guarantee you that it will be very much a “not to be missed” type of event, so we hope to see you all there! And if you’ve taken the time to read all of this, then let us give you a little heads up as a thank you 😉 Keep a close eye on our page tomorrow! We might have a little early Yule present for you!